Weekly meal plan? Can’t get by without one. Quick recipes my kids will actually eat? Yes please! Savings… and organization… and less stress? Sign me up. After agreeing to review their site I decided to explore around a bit and give their service a try to see exactly how it worked. First I was asked to enter my zip code and then select my local grocery store. It happened to have my favorite store to shop at – HEB. I did notice that a few of the grocery stores in town weren’t listed yet, but Amanda assured me that they’re constantly working to expand the stores available. Anyway, by selecting my grocery store, Food on the Table can provide the weekly sales information when suggesting meals to me – how great is that? I thought this setup was pretty ingenious. I can pick how many meals I need to plan for the week, which proteins I’m in the mood for (so I can always choose to avoid fish – ha! ), and even choose my priority for the week. If you’re like me, some weeks are crazy and I am fine with spending a little more if it makes my life easier. Other weeks (like at the end of the month!) saving money is more important. Regardless, getting to select my priority in meal planning helps ensure that the options provided will better fit my needs. Love it. If you notice that little “sale” tag next to Smoked Sausage, that’s letting me know that this product is on sale at my grocery store, so if I select it as an option I’ll be able to take advantage of those savings. 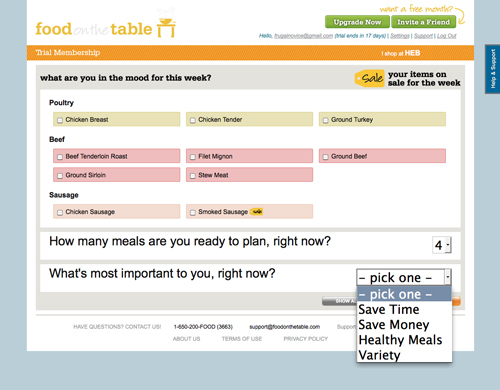 Once I answered those questions, I was taken to a screen with a recipe suggestion provided for each day. You can see in the image below how it looked – there’s a tab for each day, letting me know what protein is featured in the recipe for that day. If I don’t like the recipe, I can click “See more recipes” to get alternative ideas. There are, for most recipes, reviews and ratings available too. 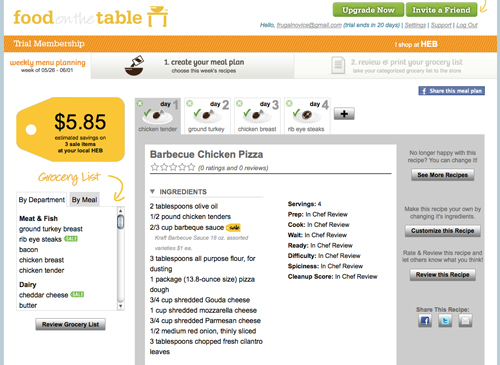 That’s pretty invaluable because it helps me know which recipes are really worth trying! On the left, you’ll notice that yellow tag with $5.85. This is a tally of how much I’ll save by purchasing items that are on sale this week. Underneath that is a grocery list; once I finalize my recipe choices I’ll get to take a look at the shopping list more closely. The site organizes my list by category, making note of any items that are on sale. I can also add other items, and it categorizes those as well. I love this feature, because I really value an organized list. It would be completely perfect if it were organized in order of my store’s layout, but I know that would be really complicated to make that happen. The current organization still serves its purpose, grouping like items together, which means they’ll most likely be close together in the aisles. In a medium skillet, saute the chicken in the olive oil until browned and cooked through. Once it’s cooked, remove from heat and chop. In a bowl, mix the chicken with 2 tablespoons of BBQ sauce; set aside. On a floured cookie sheet or pizza pan, roll your pizza dough out. 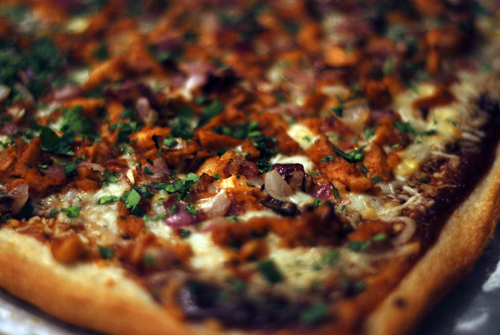 Use the remainder of the BBQ sauce to spread evenly across the dough. 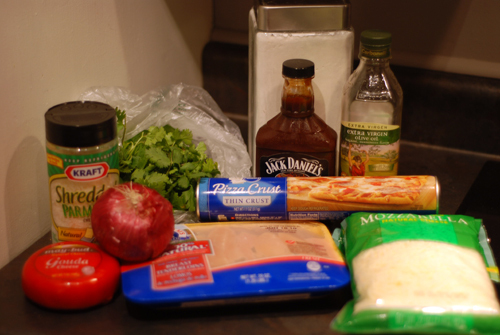 Add the Gouda, mozzarella, and Parmesan cheese; then add the chicken and onions. One note: I don’t like crunchy onions, so I sauteed some in a separate skillet to put on my half of the pizza, and then put raw onions on Brian’s half. This worked out really well for us! Bake in a 400 degree oven for 15-20 minutes or until the crust is browned and the cheese is bubbly. Mine actually took a little less time than that, I think because I used a thin crust dough. Once you’ve removed the pizza from the oven, top with chopped cilantro and slice the pizza to serve. Enjoy! So pretty, isn’t it? The cilantro provides a nice pop of color and flavor. SO good! If you want to try Food on the Table for yourself, go visit their site and sign up for a free 30-day trial (no credit card required)! If the features alone don’t motivate you to check it out, here’s another reason – a chance to win a gift card to YOUR favorite grocery store! Food on the Table has offered to let me host a giveaway for a $25 gift card to your favorite grocery store! That’s right, if you’re the winner you’ll get to let them know what store you shop at and they’ll send the gift card your way. Perfect to use right along with the Food on the Table site! This giveaway is open to all U.S. residents. Entries will be accepted until midnight CST on Thursday, June 17. 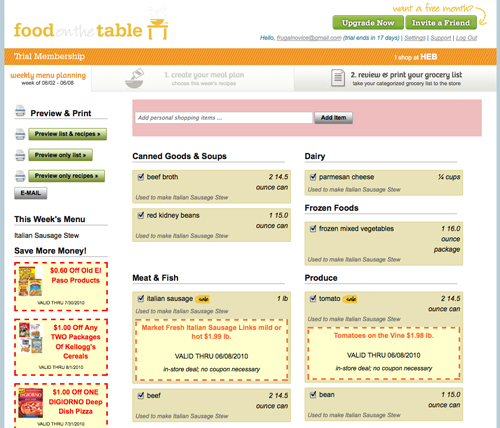 Mandatory Entry: Go to the Food on the Table site and sign up for your free 30-day trial (again, you do not have to enter any credit card information to do this), and comment letting me know you’ve done so. Please leave a comment for each extra entry – if you blog about this giveaway and get 4 entries, for example, comment 4 times. Note: This was not a paid post, and honest opinions were provided. I used the free 30-day trial available to everyone for my review, and Food on the Table is providing the gift card for the giveaway. I was not compensated. 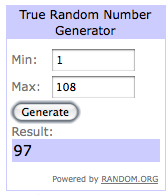 ETA: We have a winner! I signed up for a free trial – wondering how much it will cost after the trial ends?